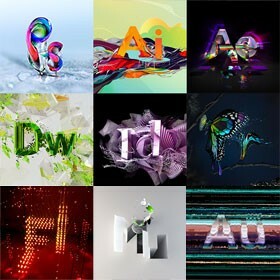 The Adobe Creative Suite offers an array of industry-leading software products for graphic design, web design, professional photography, video editing, and much more. For any aspiring designer looking at the Adobe software choices, there is a lot of overlap between the graphic design products (and for good reason!). If you are confused as to which product is right for you when you decide to tackle that new, creative project, it is helpful to know the key differences between the three major graphic design programs in the Creative Suite: Photoshop, Illustrator, and InDesign. Photoshop is the industry leader in raster image graphics creation and manipulation software. A raster is a grid of pixels, so any raster image is going to be composed of pixel information. Each pixel can hold color, brightness, contrast, and other information. When you get a large amount of pixels together in a document, it creates a recognizable image that the human eye can process. Adobe Photoshop is one of the best software tools for editing your raster images. If you take a photo with a digital camera or camera phone, you can use Photoshop to make professional edits such as changes to brightness, color information, and much more. However, Photoshop can be much more than an image editing tool. It can also create new designs from scratch. You can combine images or selections of images from several sources and use advanced layer techniques to create a new image that is greater than the sum of its parts. The blending and combination of many small images, plus the control of all the pixel information makes Photoshop an incredibly powerful graphic design tool. Illustrator is a vector graphics application, which is a completely different method to generate an image than a raster. Instead of using pixels like a raster graphic, vector graphics use paths and points to create objects based on mathematical proportions. For this reason, vector images can be scaled to any proportions without losing quality. Graphic designers mainly use Illustrator for corporate identity projects like logos and brochures, but the design possibilities are endless. Vector images will have less detail than a raster graphic because there is not the high resolution of pixels in the document. However, the advantage of “scalability” and ease of use with these types of images makes Illustrator the “go-to” for these projects. Once you have designed your graphics in either Photoshop or Illustrator, you may be ready to layout your images into one final design. Whether for print or web, Adobe InDesign is an essential tool for digital layout. InDesign is built to replace the manual design layout process. Popular features of the program include text styling and threading, master page options, and smart guides. In addition, there is a wide array of long document features to help you keep that long document organized. When you are finished, InDesign can output the design into the proper media and includes some handy features to mark-up your design for the web or prepare a file for commercial printing. While Photoshop is intended for raster graphics first, there are some vector tools built into the program. In addition, Illustrator is primarily to create vector graphics, but it definitely allows you to place raster images into the designs and can handle the translation of the two types of images. Last, while InDesign is not thought of as an editing tool, there are some basic editing features available and it also includes the ability to add some effects to your images as needed. As a web or graphic designer, the general rule is that you need to use “the right tool for the job.” If you have access to all three of these programs, then you need to be confident freely moving between them depending on the project requirements and specific situation. It is frustrating to try and force one program to perform certain tasks that another could handle much easier. All three of these programs do have one thing in common: they are a ton of fun! You can download a free trial from Adobe.com or purchase a monthly subscription to the Creative Cloud and try them out for yourself. Get creative and, most importantly, get started! If you want to learn more about the Adobe Creative Suite programs but need some help to get started, the Digital Workshop Center can help. Take a look at our available Adobe classes or private consulting. Fill out the form below to request more information about Photoshop, Illustrator, or InDesign: A beginners guide to choosing the right Adobe graphic software or to request information on customized individual or group training sessions.